Choose from 40 hotels and guest houses in Gloucestershire. Shown below a just a selection of the hotels available. To search within an area please use the menu on the right. This hotel offers the closest accommodation to Clearwell Castle, resting only a couple of hundred yards away. 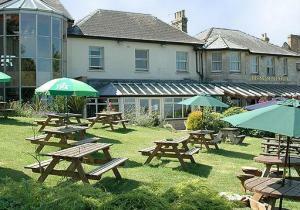 The Wyndham Arms Hotel is in Clearwell, a quintessential old English village by the Royal Forest Of Dean. The building dates back to the 13th century and boasts old oak floors, beams and open fireplaces. The Wyndham Arms Hotel was originally a manor house and then a public house that has grown in size and reputation to become a fine hotel. It has 5 standard rooms, 12 superior rooms and a suite. Luxury, style, quality, charm and character, with all modern conveniences, this 16th-century hotel offers a central location and free on-site parking. Established in 1540, the ancient Tudor House Hotel has a rich history. A chimney in the Mayor's Parlour hides a priest's hole. A secret garden is accessed by an old oak door, with axe marks said to be made by Oliver Cromwell's soldiers. 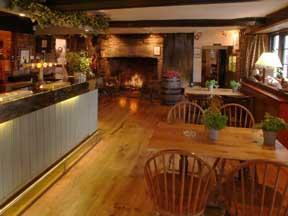 Tudor House also offers a full bar service with real ales, and the restaurant delivers fresh food at reasonable prices. Free parking is available at the rear of the hotel (accessed via Red Lane, off the High Street). With spectacular views over the Gloucestershire countryside and set in 26 acres of beautiful, peaceful grounds, parts of this charming hotel date back to the 18th century. The Royal George is situated on the Cotswold Way in the village of Birdlip and makes a wonderful base from which to explore Gloucester, the spa town of Cheltenham and the picturesque villages that make the Cotswolds world famous The restaurant, the bar, the heated terrace and the secluded garden all offer a seasonal menu, with a wide selection of modern and traditional British favourites, from hearty main courses to lighter snacks. A selection of real ales, carefully selected wines and speciality teas and coffees is also available. There are 34 comfortable en suite rooms, including feature rooms opening onto the garden and a luxurious four-poster room. All of the rooms are rich in individual character and unique charm. 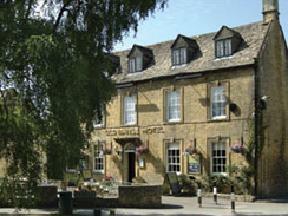 Set in the heart of The Cotswolds this warm 16th century Inn & Hotel offers the best in Cotswold hospitality! With a country inn atmosphere the hotel offers charm with open log fires and homemade Cotswold dishes and specialities Located in beautiful Blockley in the heart of The Cotswolds just outside of Moreton-in-Marsh this honey coloured historic inn is covered in Virginia creeper which turns a stunning red in Autumn. Walk inside to the scents of wood smoke from the open log fires and snuggle into a comfy chair by the fire to view the daily papers with a coffee or something stronger. Dinner is served in the warm and friendly restaurant with lighter meals and snacks available in the bar. Close-by are the villages of Broadway, Moreton-in-Marsh, Stow-on-the-Wold and Bourton-on-the-Water. Nestling on the edge of a steep hillside overlooking the Golden Valley, this 18th century Cotswold stone manor house is a hidden gem in the heart of Royal Gloucestershire. Renowned for its warmth, quality of service and 2 Rosette-winning chef, the Burleigh Court exudes a relaxed and tranquil atmosphere. Eighteen individually decorated and furnished bedrooms offer stunning views of the gardens or across the Golden Valley. Featuring terraces, ponds and pools with hidden pathways and Cotswold stone walls, the house and gardens enjoy the seclusion and ambiance of an era long-forgotten, and are listed in the Good Garden Guide. In a charming little village, on the northern tip of the Cotswolds, this traditional pub offers free Wi-Fi and is renowned for its excellent food, local real ales and imaginative wine list. With the warm welcoming atmosphere of a traditional local pub, the Churchill Arms is consistently applauded for its excellent food and is more dining than traditional pub. There are 4 en suite bedrooms and each room is individually decorated and has a telephone, a hairdryer, a TV and video, and tea/coffee-making facilities with a cafetiere and fresh milk. A full English breakfast is included in the room rate. Paxford is on the northern tip of the Cotswolds, and the pub has wonderful views across the countryside. There are some lovely walks in and around the village. You can take a half-mile stroll along the brook; a starting point for The Cotswold Way walk. Strozzi Palace offers chic boutique suites with Italian flair in central Cheltenham. The new self-contained suites are quietly located just metres from the sophisticated promenade. Each luxurious, beautiful suite has a super-king bed, kitchen, monsoon shower and free Wi-Fi. Some suites have private balconies. Ample parking stylish shops, restaurants and award-winning gardens are very close by. The beautiful, half-timbered Bell is across the street from Tewkesbury Abbey. It has a friendly bar and restaurant and cosy en suite bedrooms. 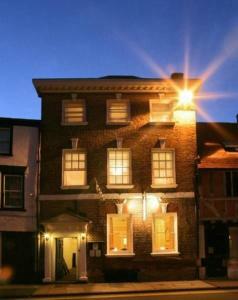 The Bell dates back to 1696 and is located in a historic area convenient for the town centre. There is free guest parking at the hotel. 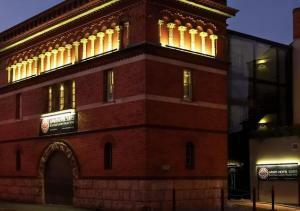 The bar and restaurant serves tasty traditional and modern dishes, and Real Ales. Each room has tea/coffee making facilities and a hairdryer. In 240 acres of beautiful, peaceful grounds between Gloucester and the glorious Cotswolds, this impressive resort hotel has its own 18-hole golf course, 2 dry ski slopes and an indoor pool. The Ramada Gloucester Hotel & Country Club has a quiet, relaxing location, just minutes from the M5 motorway and only 3 miles from the very heart of historic Gloucester's city centre. The hotel has an on-site, 18-hole championship golf course and a 12-bay floodlit driving range. The other impressive leisure and relaxation facilities include squash courts, outdoor tennis courts, an aerobics studio and a well-equipped multi-gym with cardiovascular and resistance equipment. As well as the heated indoor swimming pool, the deluxe spa offers a Finnish sauna, a steam room and a range of beauty treatments. All of the en suite rooms have satellite TV and internet access (at an additional cost). There is a bar, 24-hour room service and the Arts Grill serves modern bistro food in elegant surroundings. This 300-year-old large country guest house is in gardens and grounds beside Cheltenham Race Course, with en suite rooms, outstanding breakfasts and a location close to some of Cheltenham's best restaurants and bars. Just 1.5 miles (2.4 km) from central Cheltenham, Prestbury House has clear views of the Cotswold countryside, including nearby Cleeve Hill, the regions highest point. With croquet on the lawns in summer, and log fires in winter, Prestbury House mixes traditional relaxation with more modern facilities. Flat-screen HD TVs (with SKY) are in every bedroom and there is free Wi-Fi access throughout. Opposite is an award-winning restaurant, the Royal Oak, dating back to the 17th century. Rated by both the AA and Visit Britain as a 4-star Guest Accommodation, the Grade II listed Prestbury House keeps the feel of an historic private home. Each room is different, with family photos, pictures and many stories to tell. In the Cotswold village of Frampton Mansell, The Crown Inn is a 17th-century 'cider house' with log fires, traditional home-cooked food, locally brewed real ales and good company! 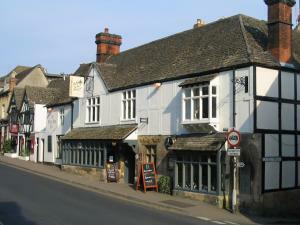 The Crown Inn is a beautiful building dating from 1633. Surrounded by Gloucestershire countryside, you can enjoy excellent views across the Golden Valley. Fine, local ingredients are used to prepare The Crown Inn's superb choice of dishes, including the popular, traditional Sunday roasts. The rooms are located in the annex. Free wireless internet is available in the public areas. Bedrooms can be converted into seminar rooms for small groups. Specialising in excellent food and wine, this 16th century inn is peacefully located in the heart of Winchcombe, a small historic town set in the Cotswold countryside. The White Hart is in the perfect location if you love walking, before unwinding with traditional, unpretentious British food and a great bottle of wine. We have a unique in-house wine shop, with 180 personally chosen wines from our global wine buying trips. Join us for nightly wine tastings from 18:00 to 19:30. You can also choose a regional cider or beer to take home with you. The White Hart aims to create a quiet, relaxed and homely atmosphere, allowing you to make the most of your stay in this beautiful part of the English countryside. This charming hotel, set in beautiful gardens and woodland, is ideally located for touring the Cotswolds and is only 20 miles from the beautiful city of Bath. The excellent road links mean the hotel is easily located from both the M4 and M5 motorways. The hotel has been personally owned by the same family for over 50 years and offers 43 individually furnished bedrooms and suites. There are a number of family and ground floor rooms, as well as 2 rooms with wet-room style bathrooms, ideal for people with mobility difficulties. There are 2 spacious and comfortable lounges plus a choice of dining rooms. The elegant Westonbirt Restaurant offers a fine selection of British and European dishes, utilising seasonal and local produce wherever possible. The informal menus in Jack Hare's are also seasonal, featuring some classic pub dishes served in traditional pub surroundings. The hotel runs a series of themed events including 'celebrity dance breaks' with Anton du Beke and Erin Boag, which have proved to be hugely popular and bookable directly with the hotel. Similarly, a superb Christmas package and New Year holiday are also bookable via the hotel. A selection of conference and banqueting rooms cater for meetings, seminars, lunch and dinner parties for up to 200 guests. The hotel is also licensed for wedding ceremonies. The surrounding area offers superb golf courses, polo during the summer months and excellent walks, especially through the National Arboretum at Westonbirt which is just half a mile from the hotel. This hotel is tucked away behind a bank of trees, on the edge of the Cotswold escarpment, between the city of Gloucester and Painswick. 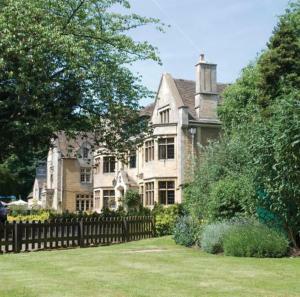 A former splendid Cotswold home, at Hatton Court you will feel eminently comfortable. Hatton Court is of reassuring size; neither large and impersonal, nor too small. Nothing is hurried. The reception is very much a lounge, with armchairs, magazines and open fires for those chillier days. Next door the bar is more a place to relax where you can take tea, read and talk rather than rush. The peace of the surrounding Cotswold countryside and comfortable bedrooms, some with whirlpool baths, make for a good nights sleep. Hatton Court is now a completely non-smoking hotel. This locally owned 17th century inn, is crammed with history, traditional local cask ales and plenty of character, and stands at the lower end of Chipping Campden's historic High Street. 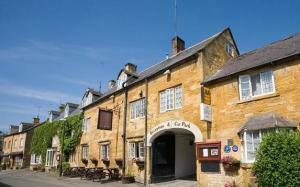 The inn is set in the small Cotswold town of Chipping Campden, an area renowned for its natural beauty. It has a peaceful position within a few hundred yards of the town centre. It is located at the start of the Cotswold Way - a well known walk along the Cotswold Hill to Bath The inn was named The Volunteer in the mid 1800's because local men used to 'sign on' there for the volunteer armies. The staff aim to supply you with a quaint, comfortable room in a homely atmosphere, as well as forwarding local knowledge on the best places to visit. The historic Barcel? Lygon Arms was established as an inn in 1532. It has an extensive spa, 7 sumptuous lounges and 2 splendid restaurants. Everywhere is warmed by real log fires. Located in a quiet and beautiful village, this lovely hotel will immerse you in history, from the stone doorways to the antique furniture, mullion windows and Georgian ceilings. Charles I and Cromwell were once guests here. The Lygon Arms is ideal for exploring the Cotswolds, but for days spent inside there is a well-equipped gym, pool and all-weather tennis courts. In the heart of Tewkesbury, close to Tewkesbury Abbey, this Grade II listed Georgian building has a private car park, private courtyard and king-size/super-king-size beds. The Jessop Townhouse (formerly Jessop House Hotel) is privately run and offers a very high level of hospitality. Retaining most of its original features, here you can enjoy a town centre location. Sample the licensed bar and enjoy Freeview in all rooms. Wireless internet access is also available. Each morning you can enjoy a wonderful breakfast menu, with a wide range of selections. 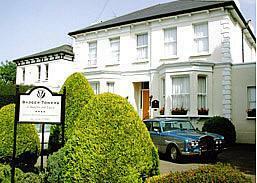 Alveston House Hotel is conveniently located just 3.5 miles north of the m4/m5 junction at Alveston. 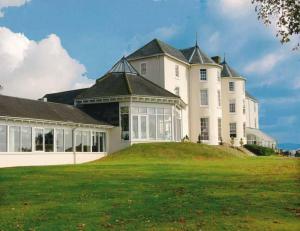 When looking for hotels near Bristol, you will find that Alveston House Hotel offers everything you need. This smartly presented, privately owned hotel provides friendly personal service in a quiet area just outside the city of Bristol. All 30 en-suite bedrooms are well-equipped and comfortable. The restaurant and conservatory menus offer dishes prepared from local fresh produce. 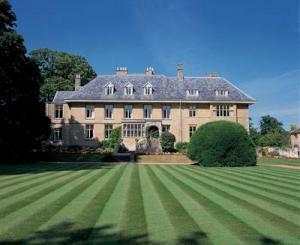 Alveston House also specialises in weddings & conferences and is completely non-smoking throughout. Please note that we do not have a lift for access to the first floor and above. The Old Manse is a delightful, relaxed country hotel, restaurant and pub overlooking the River Windrush. The Old Manse was built in 1748 and has 15 cosy, individual en suite bedrooms. Meals and snacks can be enjoyed in the restaurant, bar, heated garden terrace and riverside patio. Real Ale, carefully selected wines and speciality teas and coffees are served in the bar. Stroll around the quaint village of Bourton and explore the historic area of outstanding natural beauty. The Rising Sun is a delightful country hotel, restaurant and public house, close to the top of Cleeve Hill, the highest point in the Cotswolds (near Cheltenham). Cleeve Hill has superb views across Cheltenham to the Malvern Hills, and many of the comfortable en suite bedrooms at The Rising Sun have similar panoramic views. The restaurant, bar and heated garden terrace all offer seasonal modern and traditional British dishes. To drink, there are real ales, wines and speciality teas/coffees. The Rising Sun is ideal for the historic spa town of Cheltenham, as well as Winchcombe and many pretty Cotswold villages. An easy drive from the M4 and M5 motorways, the child-friendly Hilton Bristol has a health club with a gym, sauna, jacuzzi, steam room and heated indoor swimming pool. At the Hilton Bristol, children under 12 can stay with parents free of charge. Children under 10 can also eat for free in Chandlers Restaurant, when accompanied by a paying adult. Chandlers Restaurant serves a tempting selection of ? la carte and buffet menus, including tempting dishes such as T-bone steak, pan-fried lamb's liver and tiger prawns. There's also a lounge bar where you can enjoy a drink and a snack in comfort. All rooms include the expected facilities, with a few thoughtful extras such as 24-hour room service, games consoles and daily local newspapers. Less than a 20-minute drive from the heart of Bristol, the Hilton is only 3 miles (5 km) from the Cribbs Causeway shopping complex (The Mall). This peaceful 17th-century house built from Cotswold stone offers quality B&B accommodation, ideal for walkers, cyclists and exploring the Cotswolds. 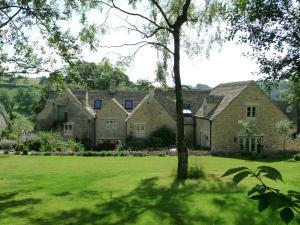 Forwood Farm is just outside the ancient town of Minchinhampton and near to Cirencester, Tetbury and Stroud. Route 45 of the National Cycle Network passes Forwood Farm. Many public houses and restaurants are easily accessible from the house, while the town of Nailsworth, with interesting shops, pubs and cafes, is a 5-minute drive or 30-minute walk away. This comfortable Victorian villa was built in the 1880s. With free off-street parking, it is 1 mile (1.6 km) from Cheltenham town centre, within easy reach of Cheltenham Racecourse. Badger Towers has easy access to the M5, M4, A40 and A46 routes. All rooms are en suite and include free Wi-Fi access, hospitality tray, flat-screen TV and DVD player. A great place to stay when visiting Cheltenham and the Cotswolds, Badger Towers is family managed by experienced hoteliers and friendly, efficient staff. Surrounded by the beautiful countryside of Gloucestershire and Herefordshire, this 17th century award-winning country inn is family owned, offering comfortable en suite accommodation in a modern annexe. On the border of Wales, within easy reach of the Royal Forest of Dean, Cheltenham Racecourse and Ross-On-Wye, the Farmers Boy Inn has something for everyone. There are a number of good golf courses in the area and plenty of great walks through some of the regions beautiful countryside. The inns' restaurant and bar area still retains many attractive period features, including the original oak beams and open fires. There is also a lounge and games room, in which guests can relax. Accommodation is on a bed-and-breakfast basis, with the rooms located in a modern, purpose-built annexe. Each en suite room has a TV, tea/coffee making facilities and a shower room, finished to a high standard. Free Wi-Fi internet access is available to guests. In a spectacular setting at the foot of the Cotswold Hills, close to junction 11A of the M5, this hotel is also well placed for Cheltenham and Gloucester. Just 1.6 km (1 mile) from junction 11A of the M5, The Chase Hotel has undergone a ?5 million refurbishment and offers 122 spacious, air-conditioned rooms and suites. Open for breakfast and dinner, Hardy's Restaurant offers an excellent choice of meals, along with a choice of fine wines. Hunter's Bar & Lounge offers a choice of drinks and light meals in a relaxed atmosphere. Reflections, the hotel's leisure club and spa, offers massage therapies and a 12-metre indoor swimming pool and fully equipped gym. Beauty treatments are available Tuesday to Sunday. The Cheltenham Chase is part of the QHotel group, AA Hotel Group of the Year. Special promotion: 2 hours' free Wi-Fi. Voucher redeemable at reception. Late check-out time of 12.00 is available on Sunday mornings. Set in 5 acres of beautiful gardens, Lower Slaughter Manor is an elegant 17th-century country house, in the beautiful Cotswolds. This hotel boasts magnificent rooms and an excellent restaurant. The beautifully furnished and individually designed rooms have a flat-screen TV and a DVD player. Some rooms have a four-poster bed or a luxurious freestanding bath. Dine in sophistication at the award-winning Sixteen58 restaurant. Relax in the chic surroundings of the Manor, with fine period features, antiques and roaring fires. Local leisure pursuits include golf and horse riding. Free Wi-Fi internet access is provided. The Barcel? 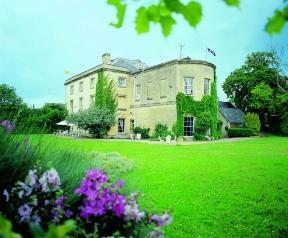 Cheltenham Park Hotel is in the heart of the Cotswolds, just two miles from the centre of Cheltenham. Free use of the great health club, 'Bodysense', during your stay. A 4 star Georgian hotel set in its own landscaped gardens with a small lake and a pergola at the rear. The gardens make the perfect setting for wedding photographs and summer cocktail receptions. For those who enjoy a round of golf, the gardens back onto Lilleybrook golf course. Situated in the beautiful unspoilt Royal Forest of Dean, this modern hotel boasts its own golf course and superb facilities for conferences, leisure activities or quiet relaxation. Situated in the market town of Coleford, Gloucestershire, Bells is conveniently located just 19 miles away from the centre of Gloucester, 7 miles from Monmouth and 14 miles from the Chepstow end of the Old Severn Bridge (M48). In addition to its on site golf course (where, as a guest, you can play at a discounted rate) and bowling green, the hotel offers access to a wide range of activities based around the local area of outstanding natural beauty. A tastefully extended Victorian manor house set in 176 acres of parkland with panoramic views of the golf course. Only 5 minutes from the M5 and within easy reach of Cheltenham, Worcester and Gloucester. A health and beauty salon offers a range of individually priced beauty treatments. The hotel grounds also feature two floodlit all-weather tennis courts. A selection of conference suites accommodating up to 150 delegates includes dedicated training and syndicate rooms complemented by a 10-acre field for team building activities. For corporate events, there is also an 18-hole par 73 golf course and west facing golf bar from which to watch the sunset over the spectacular Malvern hills. Set in a prime location on the outskirts of Bristol, this hotel is only 10 minutes from Bristol Parkway Rail Station and is easily located close to the M4 and M5. Only minutes from the heart of the city, this hotel provides an ideal base for those traveling by road, rail or air. You'll find that our staff takes pride in ensuring that out guests feel comfortable and relaxed with attentive and efficient service. Oliver's Restaurant boasts popular British cuisine. You can also enjoy a lighter snack in the bar or room service. With complimentary car parking, Wi-Fi internet connection and Sky sports, this hotel is fantastic value for guests on business or pleasure.